I Love My Amazing Animals: Bud found his better half! Bud found his better half! 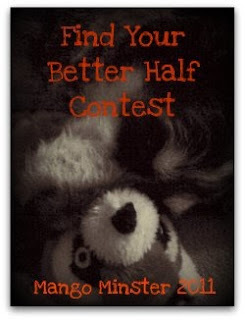 Hello Friends, Buffy's friend, Norwood is having a fun contest, it is the "Find your better half" contest! This is Bud's better half! Cute isn't she! Well, we found Bud's better half on Petfinder! You can go to Petfinder and adopt a pet. All I had to do is to put in my zip code and ask for rabbits or the pet your looking for and it gave me several rabbits to choose from! 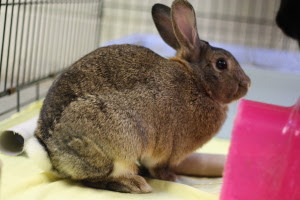 This little bunny is for adoption on Petfinder! Oh boy, I would love another bunny but we already have two. Thanks again Norwood for having this fun contest in conjunction with Mango's show! Awww Buddy and Norwood!! A match made in bunny heaven!!! Hi what a cool blog!! i am a sucker for rescuing anything, we have raised so many rabbits like these that dogs or freinds have delivered on our doorstep! they now live in a big outdoor run with the chickens...the wild ones have a better half in humpy the freindliest lop eared rabbit ever. Good luck at the contest! OMD! Bud's better half is like a mirror image! Glad you stopped by! We just became your latest follower. If you came here, you could just catch one. They live everywhere and have their warrens all over the place here. We have to be careful in the twilight not to run over them. Many are in our yard a good bit. When we surprise them, they freeze! Only the nose wiggles! They are good at sitting for photography! Best of lukhk to woo! Mom has had two bunnies in her life - and she enjoyed them!